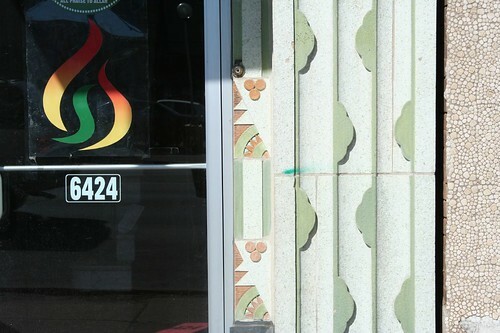 Pure coincidence let me find out about the fantastic Art Deco-facaded building at 6420-6424 N. Western Avenue: the Rogers Park Historical Society was headquartered there in the 1990s, and thus mention the building in their online history. It was designed by William C. Presto, an associate of Louis Sullivan – the same guy who called in Sullivan to do the Krause Music Store facade, the final work of Sullivan’s career. 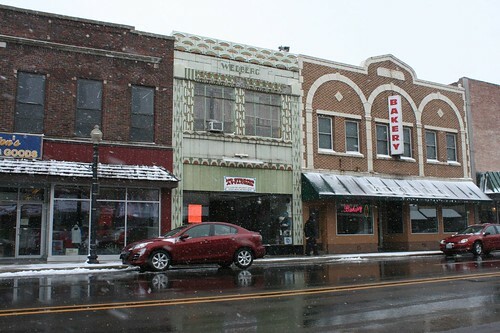 The Western Ave. building was home to Cutsler’s Cafe in 1931; beyond that, there’s not much about it in the Tribune archives, my usual research stop. It’s a beauty, though, with a design vocabulary that brings to mind vaguely Egyptian imagery but is a unique creation. Well, I thought it was unique, anyway… till I had occasion to venture through the small town of Dekalb, IL, where the exact same design style appears on a small commercial facade, the Wedberg Building. Presto must have figured nobody would notice if he recycled a design in a small town a hundred miles away! Of course, the Internet isn’t very forthcoming about this one, either. Best guess is it was built for an Albert T. Wedberg (his 31-year-old wife’s name appears on the 1930 census), who may have been a photographer (he’s credited with a photograph of the town from the same time period). 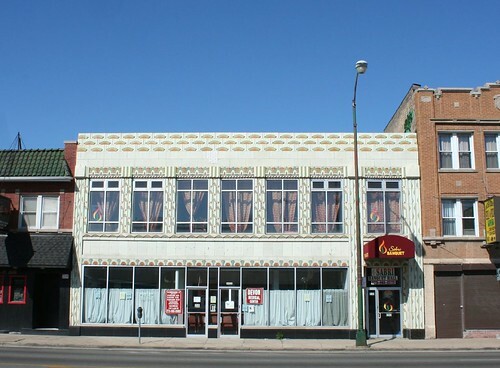 This entry was posted in Art Deco, Louis Sullivan. Bookmark the permalink. Wow, what an awesome find. Well done!